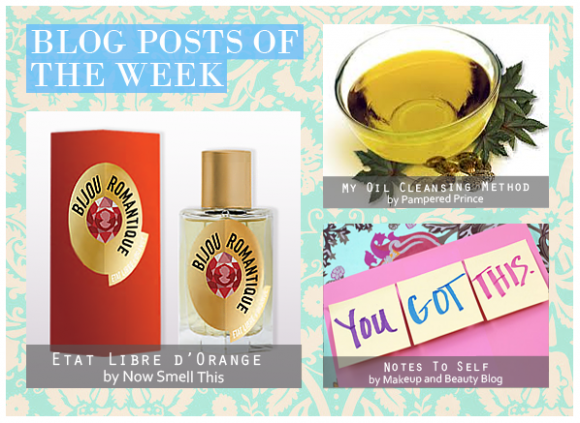 This post provides a great introduction to two new Etat Libre d’Orange scents, Fils de Dieu and Bijou Romantique. The gorgeously feminine Bijou Romantique has just launched with us at Escentual – its scent of pink pepper, ylang-ylang, iris, coconut and benzoin is unusual and very pretty. Andy tries an alien concept in this fascinating post, as he washes his oil-prone skin… with oil! The Oil Cleansing Method (or OCM) actually gleans great results for him, and introduced us to a whole new way to tackle skincare problems. This fun post from beauty (and cat) lover Karen reveals a bit about how she keeps herself motivated. She leaves notes for herself everywhere – and we mean everywhere, from her shoes to her lunch. Her quirky morale boosters are just lovely. This entry was posted on Friday, February 10th, 2012 at 8:00 am and is filed under Blog Posts of the Week. You can follow any responses to this entry through the RSS 2.0 feed. You can skip to the end and leave a response. Pinging is currently not allowed.